Once again, Suzuki is breaking new ground – this time with the incredible KingQuad 750AXi Power Steering. Its new advanced Suzuki Electric Power Steering system gives it lighter steering and even more responsive handling than ever. The Suzuki KingQuad 750 is an ATV like no other. Just like when it built the first four-wheeler, Suzuki bestowed upon its newest ATV both functional and sporting features. This KingQuad 750 is designed to be not only the best all-around sport/utility ATV currently made, but the best QuadRunner ATV Suzuki has ever manufactured. The Big KingQuad comes with available Electronic Power Steering. The KingQuad 750 is powered by a single-cylinder liquid-cooled DOHC engine with a bore-and-stroke of 104mm x 85mm – displacing 722cc. The big bore helps this four-stroke develop abundant torque, especially in the low- to mid-rpm range. The fuel-air mixture is delivered efficiently via Suzuki’s own fuel-injection system, featuring technology tested through years of development in high-performance motorcycles. Advantages of the KingQuad 750’s fuel injection system include reduced fuel consumption overall. Also, there are no choke operations or carburetor settings to consider. Electronic fuel injection provides better throttle response and smoother engine power than a mechanical carburetor. Finally, the KingQuad 750 has the ultimate power-delivery drivetrain and transmission with three drive modes available: two-wheel drive, four-wheel drive, and front differential-locked four-wheel drive. Built around an all-new high-tensile steel frame, the KingQuad’s suspension is fully independent. It’s designed to maintain the necessary rigidity of a hard-working utility ATV as well as the light weight of an easily manageable recreational four-wheeler. New front and rear brake systems help smoothly slow the KingQuad 750 — the front end features hydraulic brakes with 200mm discs at each wheel. The KingQuad 750 rides on newly designed, 25-inch, bias-ply Dunlop tires mounted on pressed-aluminum-alloy wheels. 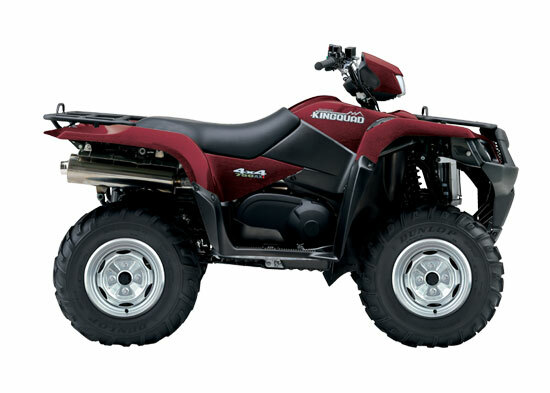 With its high-arched fenders and sharp headlights, the Suzuki KingQuad 750 combines sporty appeal with utility strength.